It’s done! My 7 days without food has ended and I’ve begun to slowly add solid foods to my diet. 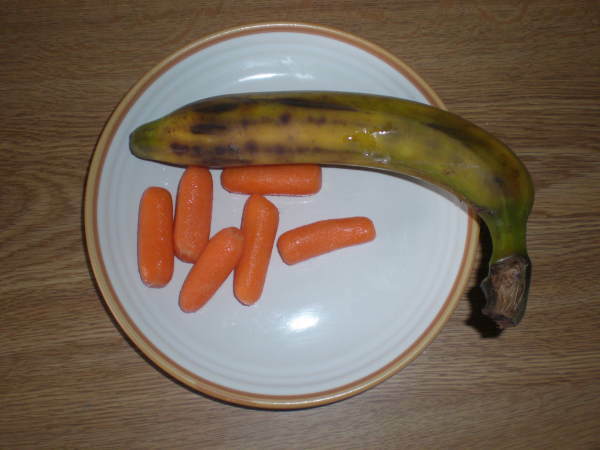 I had a meager dinner of a banana and 6 baby carrots, taking great care to chew them slowly to get my system ready for a challenge. They went down quite well, except when I was helping my suite-mate move in, and had to lift some things, but other than that, everything went fine. I later had a few peanuts and some more carrots with hummus (which was excellent!). I’m planning on trying some granola with soy milk in the morning, perhaps with an apple. My lunch will be a toasted multi-grain tomato and pesto (I made it this afternoon, the whole apartment smelt like heaven) sandwich with some carrots and hummus on the side. I will try to post pictures of my meals when I can and post instructions for their creation. I’ve been looking for a typical ‘starving college student’ meal, one that’s cheap, quick and will fill me up after a day of study. I know the most common is Ramen, which is cheap, but also quite unhealthy and rather foul. I came up with what I hope to fill that gap, and it’s vegan to boot! With my rice cooker, I’m going to make brown rice (it has a timer so it’ll be cooked when I get home!) and steam some broccoli in it at the same time. Then mix in a little peanut butter (all-natural, unsalted) and some soy sauce to make an Asian-inspired meal. If I have the time, I can saute up some tofu and sesame seeds and add for a little something extra. When I get my rice cooker, and I get my stomach ready for such a meal, I’ll let you know how it is, and a more detailed recipe and pricing.